Our moms had Martha to make them feel inadequate. But we have a whole new generation of perfection which is rapidly proliferating online. Let's call them the Marthettes. We've all been there. You start off by looking at one of the lovely web sites from which you've bought such nice vintage clothes - or just admired them. You idly scroll over to the list of links on the side and start exploring the whimsical web pages. One woman works with a vintage letterpress and lives a sepia-toned life in Asheville, cozy in her moss-hung frame house. Another photographs herself looking willowy and romantic in various vintage sundresses, posing in front of picturesquely abandoned warehouses in Brooklyn. There's the woman who has a bohemian, sun-dappled home in Silverlake, throws get-togethers full of beautiful people and makes terrariums from succulents. There's the chic, impossibly young Blushing Ambition, or the cosmopolitan "Bohemian Musings," making you feel both old and dowdy. The romantic, nature-filled life of the stunning "A Thought is the Blossom" and "Much Love" makes you curse the dying fern on your windowsill. "Just Something I Made" makes a mockery of the unfinished scarf too full of holes to give away. These talented women are in Copenhagen. And New Zealand. And London. They are all so lovely, with perfect vintage wardrobes. They can all make anything, and seem to have unlimited time to do so. Sometimes they go to music festivals, and look awesome. 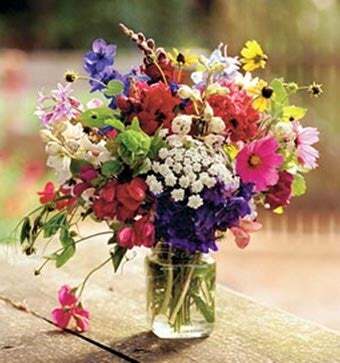 Some have penchants for putting flowers in Mason jars and photographing them lovingly. And together, this blogosphere makes you feel awful. Could the food and entertaining blogs be far behind? No: There they were, drinking iced tea out of those inevitable Mason jars, drizzling black-walnut cake with friend-raised honey and throwing romantic, themed baby showers for friends with whimsical letterpressed invitations. Oh, but it doesn't stop there. To the prospective bride, the wedding sites are a beautiful despair: always done on a shoe-string and filled with the contributions of equally talented and magical friends happy to whip out many-tiered shortcakes and evergreen bouttonieres and old-timey music. They are unique, down-home, yet more perfect than anything from a wedding magazine (although they always end up featured in said magazines). When I want to feel extra-bad about the fact that, after two years of engagement, I haven't pulled a party together, I'll spend a sleepless night on Once Wed. Or 100 Layer Cake. Or Inspired by This. Or a dozen others, all heart-stoppingly beautiful. Weddings lead to the "grown-up" blogs, what I think of as the Ready-Made set: artsy couples in cool getups building cottage industries and homes and marrying their expansive skill-sets to whip out unlikely lamps and unique storage solutions. Sometimes a strikingly beautiful child in a handmade Liberty-print frock makes an appearance, and there are often perfect, relaxed-but-orderly kids' rooms too, completely absent of Fisher-Price or old Cheerios. By the time you've spent a few hours on these blogs, you will have seen the next twenty years of your life go by, all of them falling short of what you're seeing on the monitor. Because, whereas Martha and her ilk may have preached a gospel of aspiration, this world is all about attainability. All these folks are young, on a budget, and, presumably, have day-jobs — or at least have the motivation to busy themselves with the less-glamorous end of their creative jobs (like uploading stuff, and bookkeeping) some of the time. Theoretically, you could do all this — you, too, could (and should) be living a beautiful life. But most of us are simply not skillful enough, or committed enough to beauty or, as I always end up morosely chastising myself, pure enough of heart to attain it — let alone make it look so good online. Some of us have to watch SVU reruns instead. Yes, maybe I might use someone's idea for a cupcake decoration or whip out the occasional homemade card. But it's not the same. It just reminds me that I'm falling short of the Lifestyle. I feel like Darling Darling has run its course. I no longer feel the need/desire to do outfit posts and it was getting to the point where I felt obligated because I used to do them a lot. I'm not that photogenic; I hate having my picture taken and I hate taking a hundred+ photos with my self-timer just to get a couple of decent shots. By way of experiment, I attempted to romanticize my own home with a few atmospheric shots. Unfortunately, this was going on two feet away.